The moment for which most Irish football fans will remember McAteer is a goal against Holland at the old Lansdowne Road in 2001. The moment McAteer that swept the ball past Edwin van der Sar into the Dutch net in that 2002 World Cup qualifier cemented his position in Irish football folklore. As former Irish manager, Mick McCarthy, says in the book's foreword "it was a defining moment" for McCarthy, his team, and the Irish public. It effectively meant that Ireland had qualified for a World Cup finals for the third time. Even remarkably this was McAteer's start for club or country in five months. Of course qualifying for the 2002 World Cup in Japan and South Korea also gave rise to the infamous Saipan Incident involving an explosive exchange between McCarthy and Irish captain Roy Keane. In this latest report on those fateful events back in 2002 we learn a new element from McAteer. Apparently some of the England players were already betting that Keane would never kick a ball in the World Cup. "The Manchester United lads were stirring that one, apparently they claimed, with good reason." This suggests that Keane may have been in touch with one or two of the squad at United expressing his severe discontent even before the row with McCarthy. Another new take on the row is that McAteer believed that Keane was fully expecting McCarthy to raise the issue of the incendiary Keane interview with Tom Humphries of the Irish Times. In the past Keane suggested that it was an ambush by McCarthy however McAteer believes that Keane "... had his response ready ... It was all too well planned, too thought-out in his strange head ... it was almost like he wanted Mick to make a big deal of it in front of the lads and give him an excuse to get out of Dodge." Of course the incidents around Saipan are just a small part of the Jason McAteer story. His playing career with the Republic of Ireland was largely a joyful experience for the Birkenhead man. The contrast between his experiences at the 2002 World Cup and his first World Cup in 1994 couldn't have been more stark. He elaborates about his happiness at being part of the Three Amigos (with Phil Babb and Gary Kelly) in the USA. And of course he takes us through his club career that started with Bolton Wanderers in 1992 and finished with Tranmere Rovers in 2007. His other clubs included Blackburn Rovers, Sunderland and of course his boyhood favourite club Liverpool. Despite McAteer's apparently embracing of the cheerful cheeky chappy character he reveals that a darker side emerged soon after he gave up playing football. Without anything to fill the void, he was left to his own devices and all sense of self-worth and belonging was quickly lost. He spiralled out of control and it culminated in him contemplating suicide. "I was driving through the Mersey tunnel this day and the cars on the other side of the road are heading towards me and I just thought 'If I just give it one of them right now and go right across the road the cars will smash into me and that'll be it." Clearly McAteer didn't go through with it however it is an interesting and disturbing insight into someone that we all, perhaps, think that we know. Jason McAteer's life and football career has been loaded with highs and lows. His autobiography presents us with an interesting perspective on football events and football characters that some of us believe that we knew and understood. 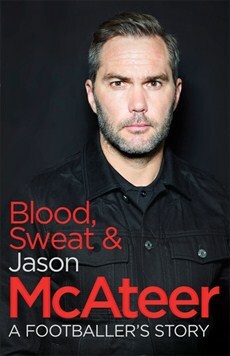 Blood, Sweat and McAteer is a bloody good read.